Top 20 proven tips for new moms. Click here to know more!! Your whole world has changed after you had your little bundle of joy. You have a brand new baby. Finally after all that dreams of having your baby in your hands, you are new to this whole “Mommy” thing. It has been an amazing and an enthralling journey full of surprises right from day one.I believe that it would be the same fulfilling and mesmerizing feeling for you too, when you see your little one holding your fingers and recognizing you by your voice. Furthermore, let us be honest here there are times when it is completely overwhelming and intimidating too. 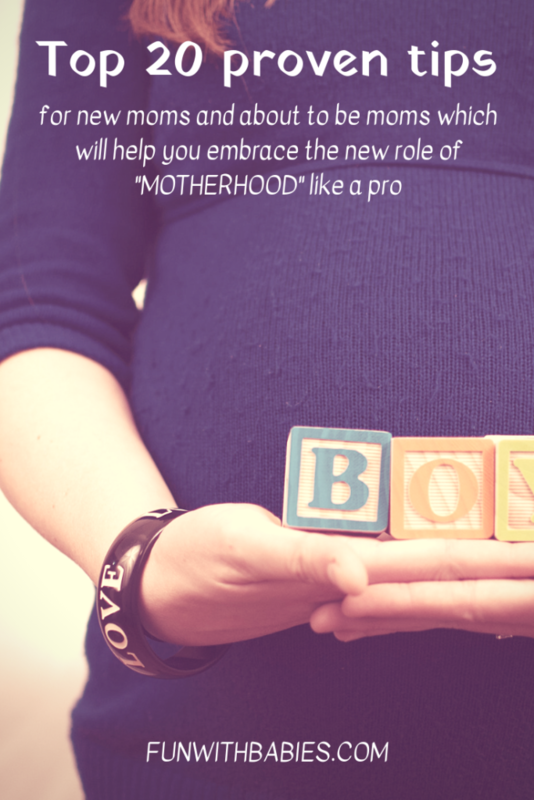 So here are top 20 proven tips for new moms which will help you embrace this new role like a pro. I hope these tips help you as much as it helped me. Congratulations on being an awesome mommy already!! You might be expecting the baby to look like you or your husband or someone in the family just like the rest of us. Turns out your baby looks like any other baby. Babies won’t be as cute looking or chubby as you expect them to be. They might even lose weight over the few days only to gain it back in the next few days after that. Once they start feeding they will tend to grow soon and start looking chubby, cuddly, cute with beautiful facial features and might start resembling someone. The transition is beautiful. Take pictures and show them when they grow. You just delivered a baby and we understand how exhausting and stressful the hospital journey and the birthing process has been. Consequently you need to take a lot of rest for your body to recover. You can only focus on feeding the baby and connecting with it by cuddling, leave the rest of the stuff for the family. Involve the dad in baby care which will consequently result in increase in bonding between them. The baby was inside the womb for the nine months and there has been research which says inside the womb is a very noisy place. Hence you need not tiptoe around your baby. Normal noises would not disturb a sleeping baby. So you can continue to do your chores around the baby. Some kids, for example my baby boy never even woke up to the sound of mixer or the traffic sounds. On the contrary, there are babies who wake up to the slightest sound. If in case you have such a baby you can take help of white noise or play soothing music when they sleep.Hope you get something done when they are asleep!!! When people are offering to help, please accept it. Relax and enjoy your time with the baby. Everyone understands what you have gone through, so there is no need to be embarrassed or hesitate in asking for help from your closest relatives. This will help you revive yourself and build some energy as you have a long way ahead. I had always thought that breastfeeding would be easy because it’s a natural process for a mother and a baby. I had an illusion that it will come naturally but I couldn’t be more wrong. There are some babies and mothers who are pros and naturals when comes to breastfeeding, but I belonged in the lot who faced a lot of difficulties. My baby boy was not able to latch easily. Consequently I was facing challenges in feeding him even with the help of nurses in the hospitals. All of us might not have access to lactation consultants, hence you can contact your baby’s pediatrician for help with breastfeeding. This process will become easier as days pass by. Till then hold on tight and happy feeding!!! Babies tend to grow exponentially in the first few months so don’t stress yourself in buying any fancy baby stuff. Most of the fancy stuff ends up being unnecessary and outgrown too soon. You cannot resist yourself from buying special pieces but try not to spend too much on new clothes for babies. Most of the babies will have gas problem during the first few months. They will be cranky when they are not able to release the gas. You can help by burping them. If burping does not seem to help with the gas, you can try bringing their elbow and opposite knee together. This will cause them to fart in turn releasing the gas. You can also feed them diluted “Oma water”(Carom water/Ajwain water) twice a week which is seen to be helpful. Till date we feed our little one Oma water to avoid gas troubles. For your baby everything around it is a whole new world because all this long he/she was inside your womb. Consequently anything and everything seems to act as a stimulant for them which makes them more alert and inquisitive to play more. But we should try to put the baby to sleep after and hour and half of a awake time. This will help them relax and promotes their physical as well as developmental growth. This will help them have long hour of sleeps in the night-time. Babies generally tend to nod off when they are feeding. Please try to keep the baby awake during feeding , because if they are awake they will feed enough to fill their tummies for nap time. Otherwise, if they sleep during feeding they will wake up hungry again after sometime (generally happens when you are just about to rest). You can tickle them lightly, talk to them (find any activity that entertains them) to keep them awake. Sometimes babies just need to cry even after all their needs have been taken care of.So just breathe and try to relax. Trust your baby to lead your way. Love them more, Cuddle them!! I wanted to breastfeed my son because as we all know it is the most important gift you can give your child. But it did not work that way, as it goes I did not have adequate supply of breast milk. So we had to switch to formula milk. It is ok to feed the babies formula milk because it is the next best substitute for a mother’s milk. There are mothers who don’t have any breast milk supply at all. Mom’s do not be sad your baby will not be void of all the nutrient and other requirements. Talk to your little one’s pediatrician and see what suits the baby and feed it. You just pushed a baby out, so you are bound to be tired and emotional. There has been a drastic change in the hormonal level of your body. This makes you sad and emotionally exhausted most of the time. It is completely ok to feel like this. Have a friend or a relative on speed dial whom you can rant about anything and everything, who you can tell your fears about but a person who would not judge you. This will help you calm down and relax. I thank my husband Bharath for being my confidant and always being there for me in worst of times after the delivery. Chemical detergents even after wash can be harmful on the baby’s skin. This in turn can cause baby skin problems like rashes, acne etc. You need not buy too many clothes for first four to five months as you will get many pairs in gifts from well wishers (in naming ceremony/cradle ceremony). In India we generally have a tradition of passing the wearable baby clothes to the baby next in line. This ensures that since the cloth has been used it will not be harsh on baby’s skin. Not only clothes, baby gears like cradles and rockers play gyms and also can be borrowed and used because they will not be used for a very long time. A walk in fresh air clears your mind most of the time. It did wonders to me when I came out after being in the same room up to 15 days of delivery (a tradition followed in my native place Udupi, Karnataka). Always listen to your instincts. Do whatever makes you and your baby happiest. After all a happy mom is a good mom. Your level of modesty will decrease and it is OK!! Your level of modesty will decrease significantly once your journey to the hospital begins. The doctors and nurses frequently checking for dilation. The delivery process, the nurses helping with nursing, sponge baths, frequent visitors who won’t budge even if you want to feed the baby, etc are frequent events which will cause you to give up on whatever strand of modesty is left in you. It is ok . Embrace the super fact that you just gave birth to a baby, which cannot be done if you hold on to your modesty. Your body will be tired for a few weeks after the delivery. It will take months before you get back the pre pregnancy energy and body. Your hormones are racing up and down as if on a roller coaster. One moment you are happy looking at your baby and the next moment you might burst into tears. Most importantly take one day at a time. Give yourself time to heal. Do not keep too many expectations. New moms there will be a war zone down south for many weeks after the delivery. It varies from person to person. Irritating as it is with caring for a baby and caring for yourself with the blood show is difficult. We have to deal with it. So prepare yourself mentally for this. Periods might come when you least expect it. Again start of periods after the delivery also varies from person to person. For some people it will begin right from next month of delivery and for some it would not begin for a year at stretch. I got my periods right from next month whereas my cousin got her periods 7 months after the delivery. It is dependent on your body being ready to resume normal routine internal activities. It is ok to use diapers at least when the baby sleeps. According to me diapers were created to make a mother’s life easy. I would not suggest using diapers all the time. But I would like to suggest putting diapers on babies when they are sleeping. Sleep is very important for babies for their overall development. Likewise sleep is also very important for new moms too because it heals your body and relaxes you in turn helping you keep your sanity. Wearing diapers helps them sleep longer.Note: There might be cases of diaper rash in babies if the soiled diapers are not changed immediately. Make certain diapers are taken care of properly and promptly and it is a boon for us mothers. For all the new moms, the first few weeks are certainly very hard, but they are not forever. You will feel normal again. Be gentle with yourself. You might be doing it for the first time and even with guidance it might still be difficult and different for everyone. Relax ! !The best is yet to come!! Thank you for taking time to read the article. If you have any tips which might help other mothers please mention them in the comment section below. Thanks Ramya!! Much needed article for me to read. Relieved to know that everyone under go the same issues.